It is easy to keep a happy and healthy tortoise. They have a few requirements and these are basic and easily met. We are more than happy to help with any questions that you may have, and can provide information on any equipment that you need. Please contact us if you have any further questions after reading the guide. Tortoises spend lengthy parts of the day basking. Its what they do! Although tortoises only drink very little, it is always good to have a source of water available. As with any pet, feeding them the right food is important. Tortoises will happily forage for themselves, however, there are a few things we can do to make it easier. 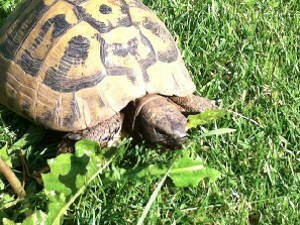 For example, growing or picking dandelions are a great source of nourishment for a tortoise. Other natural growing plants such as Chicory, White Clover, Sow Thistle and Heartsease add to a great diet for your tortoise. It is important to keep an eye on your tortoises and get to know their eating habits. On the off chance that a tortoise is not eating, it is possible to encourage feeding by hand. But be careful, tortoises are notoriously lazy and will grow accustomed to being fed by hand and may refuse to forage for food themselves. In some of the colder months when natural plants aren’t growing, or if you can not find any, supplement a tortoise’s diet with tomatoes, cucumber and other salad vegetables. These foods are often high in water and low in nutrients, and should only make up a small part of a tortoise’s diet, really a last resort. It is important that old food is not left to decompose on its own. Mainly because it may rot, or cause harmful bacteria to form and harm you tortoise. That, and it looks untidy! Dog and cat foods, high protein feeds like peas and other legumes and also tinned meats and highly processed foods should be avoided at all costs. These rich foods are not suitable for tortoises and will cause developmental problems including deformed shell growth and bone problems. Foods high in sugars (including very ripe fruit) are unsuitable for many species too, as are certain vegetables such as cabbage and spinach. Feeding foods such as these can produce kidney failure or bladder stones and may result eventually in the death of your tortoise. The only time that you can expect your tortoise not to eat, will be when he has just woken up from hibernation, or at the end of the year when he is winding down in preparation for his long winter sleep. However, if your tortoise is normally happy and eating well but suddenly refuses to eat, then this can be a sign of constipation. To help with this, a shallow warm to the touch bath is advisable. It is important to ensure that the water is only warm to the touch and not hot. Also ensure that the tortoise’s nose is well above the water. Fifteen minutes to half an hour is normally enough time to solve a sluggish bowel, however, if your tortoise doesn’t seem to regain his appetite, then a trip to the vet is needed. It is important to make sure that the tortoise is supervised the entire time while taking a bath. The tortoise trust have a thorough guide to hibernating your tortoise here. All animals need a good degree of natural light in order to prosper. It is the same for tortoises. When living outdoors tortoises should have access to a good source of natural light. This can mean them freely roaming the garden or their own “Tortoise Garden”. On the other hand, during the colder months, heating lamps are a good source of light and heat. An indoor residence may also be needed for when the weather is bad, or when the tortoise is very young. For this we have found that a “tortoise table” heated and lit with a lamp works best. Greenhouses and conservatories can also be used, so long as they are not allowed to get too hot. Shade is equally important, whether it is provided by neighbouring buildings or trees, a man-made structure, or varying mounds of dirt and clumps of shrubbery. A healthy tortoise is a happy one! So it is important that a tortoise’s health is maintained. Check for worms in their stool rather than blanket de-worm. This is important as worms can not only be passed around to other tortoises, but it can be passed on to people as well. New tortoises entering a new group are encouraged to be put in to a “quarantine” or isolation for a few weeks, just to ensure that it is not carrying any diseases or infections. One question we’re often asked is: Should you segregate the sexes if you have more than 1 tortoise? The answer is no, but ideally you should have more than 1 female per male to avoid harassment (the ideal ratio of males to females is 1:3). It is important for anyone buying a tortoise, to be that they are completely different from reptiles like lizards and snakes. When setting up an indoor enclosure, a humid tank meant for a lizard or snakes will not do. Tortoises like to wonder over large distances of sand/desert like terrain, and will find a humid, confined tank distressing and may lead to illnesses. Because of this, we advise against buying one of the highly advertised tortoise vivariums online. However, there are some really good tortoise tables available and these provide adequate lighting and enough space for your tortoise to ramble around freely, allowing for plenty of room. In my, and many other people’s opinion, there is nothing better than having an enclosure that is based out of doors. The tortoises are able to roam freely, enjoy the fresh vegetation, and retire in to a safe a warm area at their own convenience. It is important that an outdoor enclosure is entirely closed off, so that you have no escapees. This can be easily done by laying planks of wood on their sides. As long as the barrier is higher than a foot (12 inches) high then it should be fine. Some tortoises are better escape artists than others, so be wary of new arrivals! Tortoises like to have a shaded space to retire during the hotter or colder part of the day, as well as to sleep. This can be anything from an over turned pot, man-made structure or a thick bush to crawl under. This kind of enclosure can easily be adapted for a greenhouse/garden combo, and will suit your tortoise’s needs sufficiently. There are many different things that you may want to put in you enclosure, but the most important is the plants. It is important that there are no poisonous grasses or plants in the enclosure. 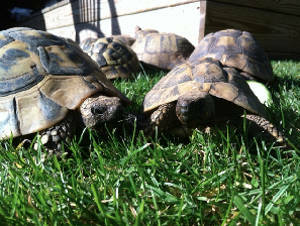 You could plant simple plants like dandelions and white clover for your tortoises to snack on. Tortoises like the sun. So in order for them to “catch the rays” you could think about making small hills and valleys for them to prop themselves up on. Large garden stones work great, and it allows the tortoise to prop themselves up and lounge in the sun at their own pleasure. It’s good to know that a pretty garden does not have to be compromised in order to make it “tortoise friendly”. The key point to remember is, think like a tortoise when planning and building an enclosure.